There are details of more than 450 software tools for making various types of information maps and outlines here. 240+ are current, nearly 60 are no longer supported but can be found at download sites and the rest are here purely as a historical record and are categorized as Historical (defunct). goes deep into the past … really deep. Learn new techniques, different types of visual tools, and their varied uses from WikIT. 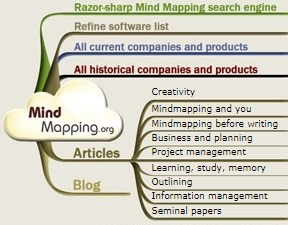 Get new ideas from online mind map directories and libraries. If you have questions about mind mapping or concept mapping, give me a shout on Twitter. I’ll try to help. This page was last modified on 31 July 2018, at 04:09.